Canadians have reacted with dismay to reports US President Donald Trump questioned whether Canada burned down the White House during a call with the country's leader, Justin Trudeau. British forces did set fire to the presidential residence during the War of 1812 with the US. But Canada did not exist at the time - it was made up of British colonies. "Didn't you guys burn down the White House?" Mr Trump reportedly asked in a call with Mr Trudeau over new tariffs. It is not clear if the comment was intended as a joke, but CNN report that it followed an exchange in which Mr Trudeau asked how the US could justify the tariffs as a "national security" issue. The US imposed tariffs on steel and aluminium imports from its allies - the EU, Canada and Mexico - last week. 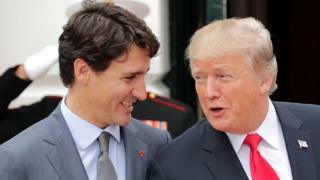 "It is simply ridiculous to view any trade with Canada as a national security threat to the US," Mr Trudeau has said of the move. "Canada became a country in 1867. The War of 1812 was in... 1812," one Twitter user wrote in response to the reports. "The War of 1812 is trending proving once again that 2018 is insane," another said. "Look on the bright side: At least [Trump] knows what the War of 1812 is and that during it, someone burnt down something," one user wrote. New York Times correspondent Glenn Thrush joked that "some young Republican researcher is Googling frantically to see if any British-Canadian units did in fact participate". Others suggested sparing a thought for the historians who may be inundated with media requests. The White House was set on fire by British forces in 1814 during the War of 1812 with the United States. The reasons for the war included US frustration at the British forcing American merchant sailors into the Royal Navy, as well as trade restrictions on the US. Another factor was British support for Native Americans as they fought against the US government's westward expansion. British troops led by Maj Gen Robert Ross attacked and burned public buildings including the Capitol, Washington Navy Yard and the president's mansion during the conflict. It was the only time that a foreign power has captured and occupied Washington. Meanwhile, US troops attempted to invade British colonies in what is today Canada, assuming they would be easily overrun. The operation turned into a military fiasco. Not only were the US militiamen repulsed, but British soldiers instead invaded the US and took Detroit. American pride was restored by several naval victories over the Royal Navy.